With the Indian Point closure now set for 2021, the race is on for clean alternatives from Canadian hydro to DERs. Going big into offshore wind comes later. Quickly moving from one energy source to another takes a lot of planning in advance. Just ask the state of New York. On Monday, New York Gov. Andrew Cuomo announced an agreement to shut down the 2-gigawatt Indian Point nuclear power plant by 2021, several years ahead of schedule. Then, on Tuesday, he announced a grand plan to build 2.4 gigawatts of offshore wind by 2030, starting with a 90-megawatt project off the coast of Long Island. The back-to-back announcements are linked in their rough size, as well as in their intention to help meet New York’s Clean Energy Standard, which aims to supply 50 percent of the state’s electricity needs with renewable sources by 2030. But they’re not completely synched up in terms of schedule. That’s because the state is losing a big carbon-neutral resource with the closure of Indian Point, which is being forced by safety and economics issues. And while New York’s new offshore wind ambitions could catapult it into the top slot for U.S. development of this green resource, it’s not going to come on-line in time to replace what the state is losing in nuclear power. That puts pressure on New York to find carbon-neutral alternatives to replace nuclear generation in the next five years -- and to keep costs to ratepayers down while it’s at it. Specifically, the state has been working since 2012 on a plan to replace a resource that serves about one-quarter of the metro New York area’s power needs with a set of demand-side and distributed generation resources downstate, along with a lot of upstate wind and hydro power and the new transmission capacity to deliver it, he said. One big option is the $2.2 billion Champlain Hudson Power Express transmission project, which should be finished by 2021, he said. That has the potential to bring 1,000 megawatts of low-carbon hydropower from Quebec to New York City via underground high-voltage direct current (HVDC) cables, he noted. This project would take care of about half of the reactor’s generation capacity in one fell swoop, although it’s still under development. He added that NRDC hasn’t taken a position for or against the project. But increased transmission capacity, such as the 450 megawatts brought on-line last year under the Transmission Owner Transmission Solutions (TOTS) program, will help integrate ever-cheaper wind power into the state’s energy mix, he said. New York already has about 2,000 megawatts of onshore wind as part of its system, and that figure is expected to increase over the next five years. The state is also expecting more solar power under its NY-Sun initiative, with the potential to realize more than 3,000 megawatts of solar PV statewide by 2023, he noted. NRDC would also like to see New York’s broader “50x30” renewables program boosted with early-stage targets to help bring more wind, solar and other low-carbon resources on-line in time for Indian Point to close. New York made $150 million available for large-scale renewables funding last spring, although the state has also struggled to process the backlog of proposed grid-connected projects as a result. 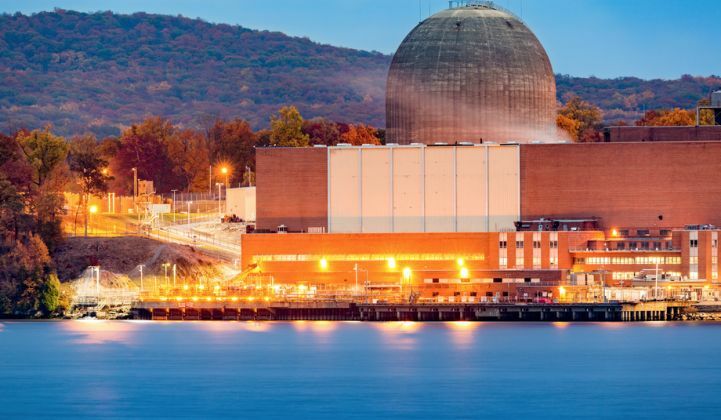 A smaller, yet locationally significant, portion of the responsibility for replacing Indian Point will come from demand-side resources -- energy efficiency, demand response programs, and on-site generation. As of 2016, the state had nearly 100 megawatts delivered, and another 50 megawatts committed, from a combination of these technologies. These range from overall efficiency gains, such as the 27 megawatts obtained through LED lighting replacement projects, 30 megawatts of HVAC and building management system controls, and another 25 megawatts of demand-response-enabled load. And while energy storage is still a small part of the state’s mix, with less than 1 megawatt achieved and 15 megawatts committed, New York City has a goal to bring 100 megawatts of advanced energy storage on-line by 2020. The state’s Reforming the Energy Vision proceeding, as well as its burgeoning microgrid developments, could lead to more investments on this front. It’s important to note that New York isn’t abandoning nuclear power entirely, as California is doing with its decision to close its last remaining reactor by 2025. Gov. Cuomo has approved hundreds of millions of dollars of subsidies to help keep four financially struggling upstate nuclear plants stay open, a plan that is now the subject of a lawsuit by energy companies. New York's first offshore wind push will be a 90-megawatt project 30 miles southeast of Montauk, to be delivered to the Long Island Power Authority. This project has been in the works since last year, and could be up and running by the time Indian Point’s last reactor is shut down, Morris said. Beyond that, Norway’s Statoil has won a bid for rights to develop a much larger project, roughly equidistant to Long Island and the Jersey Shore, that could add up to as much as 800 megawatts of capacity. This would be the first installment in the 2,400 megawatts by 2030 called for by Gov. Cuomo, with details on how to get there to be fleshed out by an Offshore Wind Master Plan coming from the New York State Energy Research and Development Authority.